Have you ever faced spine-tingling experience with Outlook because of Outlook delay delivery not working? You have spent the whole day crafting stellar emails for your campaign. Then you open your Outlook and schedule when they need to be delivered. After checking your email reports after a week of hard work, you don’t see any activity. Looks like Outlook deliberately decided to betray your trust? Like many other disgruntled Outlookers, you must be wondering why on earth would such a popular email client have to be opened to send a delayed message. That’s when you wish you would travel back in time and furiously hit that Send button. Fortunately, there is a convenient workaround for the “Delay delivery with outlook closed” problem. 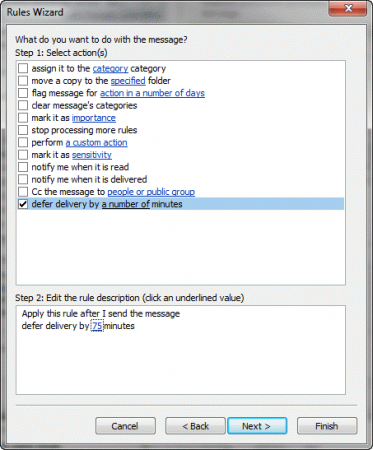 HOW CAN YOU DELAY SEND A MESSAGE IN OUTLOOK? WHAT HAPPENS WHEN THE DELIVERY TIME IS REACHED? HOW TO OVERCOME OUTLOOK DELAY DELIVERY HORROR. 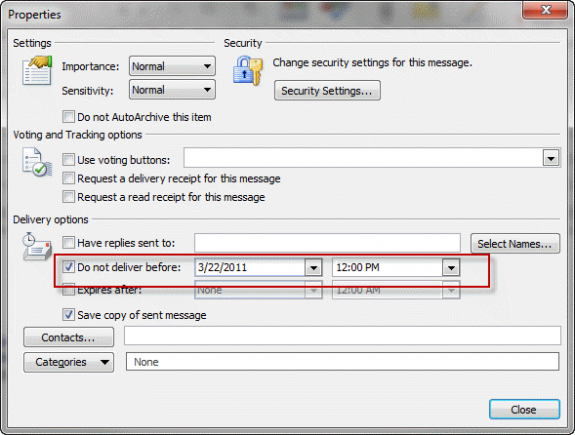 This option requires you to create an “after sending” rule in your Outlook allowing you to hold messages for up to 2 hours (120 minutes). This rule isn’t selective – it works on all messages, including the ones that meet the set delivery conditions. Go to the Rules Wizard and click New rule. Check at the bottom of the first Rules Wizard screen. From that screen, select Apply rule on messages I send. You can then select all the conditions you want. Once you are satisfied, then click Next to apply the conditions to all messages you send. Still, at the Rules Wizard, head to the bottom of the Actions list and check defer delivery by a number of minutes. The ensuing window brings up the “a number of minutes” link. Click that link to select the number of minutes you wanted to hold the messages in. Proceed to Next if you still have more exceptions you might want to set up, enter the name of your rule. Hit Finish to finalize the rule. 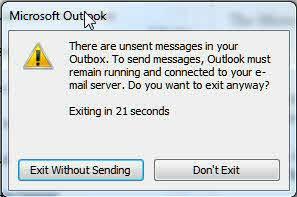 If you hate defining ‘time to send rules” every time, Outlook gives you a “Do Not Deliver Before” feature. So that with this one, you can schedule when the email will be send. For Office 200 and above, clicking Options dialog on the top ribbon will take you to “Do Not Deliver Before” option. But always make sure you understand how this feature works. Test, test, and test this features before using it. Why do you need to test it beforehand? It helps prevent possible ‘delayed send’ because of conflict in timing. 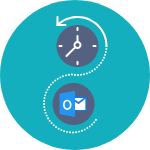 After testing it, you will establish if your email server uses the time you sent it to the Outbox or when Outlook actually sent the message to the SMPT server. Other than sending the message, there will be no trace of your clicking Send earlier than that time. Since some Outlook versions don’t use the date they handed the message to SMTP server, which means if you use sort by sent date view, you might miss the email. Why is it a red flag? In this era, when marketers are flooding our inbox with emails, it’s so easy for your message to ‘disappear’. That might mean a lost opportunity. When using the feature your email stays in the Outbox on your computer. The message stays there waiting for the delivery scheduled time. For Outlook to successfully send the messages as planned, you have to keep your computer logged in and Outlook open to send it. Outlook will fire off your email next time you launch it. The same thing still happens when working offline. Outlook won’t send your email at the scheduled time of delivery. Instead, it will fail and then show an error. However, Outlook will send the message as soon as internet is connected again. To re-initiate transfer, use the Send All command. Unfortunately, it won’t be delivered when you wanted it to go. 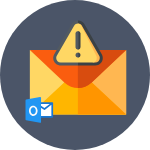 Just because you don’t risk failing to send the email, Outlook will pop up a cautionary prompt to remind you about the messages scheduled for later sending every time you try to close Outlook. Using SalesHandy you can schedule & send emails even when your Computer is off! Outlook is still a popular email client. Millions of people use it to send emails every day but very few know how to really make the most of its features. While learning a few tricks can save you time and increase your efficiency, finding a way to do away with “send delayed email when outlook closed” phenomenon could be your best bet. 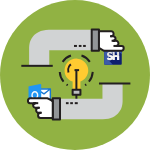 If you look inward and you’ll find more suitable ways (think about Outlook’s extensions and plugins) you can take advantage of to optimize your email timing. For instance, using SalesHandy Outlook plug-in, you can easily personalize your email delivery down to the hour, at the right time and the right day. Download SalesHandy Outlook plug-in and install it on your PC. You can download the plug-in here. Schedule Unlimited Emails- Try it Now! Refresh your Outlook. This will activate the SalesHandy tracking feature and it will appear on the ribbon carrying the sales tools. In order to track and schedule your emails, you’ll need to have SalesHandy account. 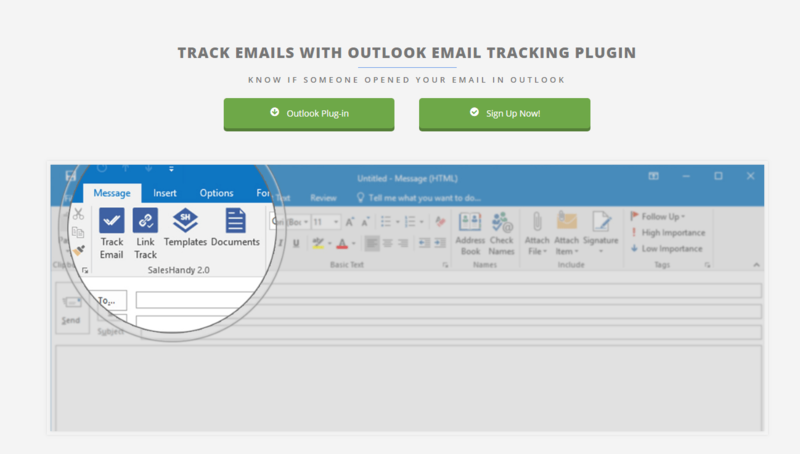 Now you can successfully track & schedule an unlimited number of emails, track the links that you add in your email, track the documents that you attach to your email and use the email templates that you add in Saleshandy. If you are new to SalesHandy, you can sign up for your free trial here. If you have news that you want to share with your recipients at a later date, Outlook will do that by delay delivery but for this, your Outlook application needs to be open and connected with the internet all the time. Use SaleHandy so that you can delay delivery when the computer is off.